Standing from a seated position is one of the most common activities in our daily life but it can be difficult if you have arthritis. We estimated that over 7 million people in Canada and the US had moderate to severe arthritis in 2005 . Many others will temporarily have difficulty getting up after hip or knee replacement. Others may become dizzy and be at risk of a fall when they get up to stand because of a temporary drop in blood pressure. A transfer pole can dramatically increase the independence of someone who has difficulty standing up. They are easily installed without the need for drilling holes in the floor or ceiling and can be removed without damage to the surroundings. In the video above, Dorothy describes her experience after installing one of these poles. To determine the best place to locate these poles. We tested three different pole designs, each in 2 different positions. The first design is a single vertical pole, the second a vertical pole with a horizontal grab bar attached, and the third a set of two vertical poles (one on either side of the user). The poles were positioned either such that the user could reach the pole without having to bend forward or it was place further away which requires the user to bend forward a little. 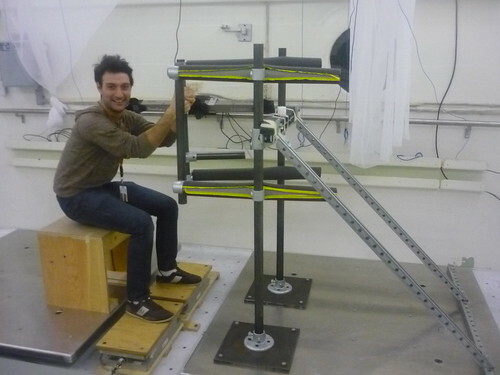 The photo below shows the experimental setup used for this study. Dan, Alison, Tilak and Geoff.